Buying clubs for your young golfer should focus on fit. Golf is a game for all ages. When your youngster has demonstrated an interest in the game and wants to play, give her the opportunity to play with her own clubs. You'll need to find clubs that are the right weight and length at a price you can afford. Buy clubs at the beginning of the season so your child can get a full season out of properly fit clubs. Make sure the clubs are the correct length. Most clubs for juniors have a recommended sizing chart on the box or hang tag. Parents are tempted to buy longer clubs and let their child grow into them. 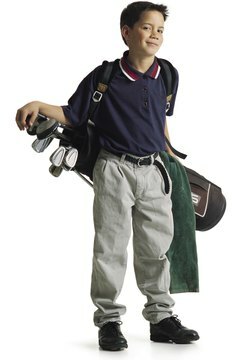 The junior golfer will struggle with long clubs, so buy clubs the right size or only slightly long. Buy clubs that have reasonable flexibility but are not extra-flexible. A golf professional or professional club-fitter can help you with shaft flex. For most juniors, the clubs for their height will be the correct flex. An older junior who is shorter but strong might find shorter clubs to be too flexible. Buy lightweight clubs. Junior clubs should be lightweight, and most available in stores today are. Avoid older junior clubs or cut-down adult clubs. Measure your child's hands for the size of the grip. The golf pro or club-fitter can help you with this. Most junior clubs will have the proper size grips, but a child with larger hands will struggle with a standard junior size grip. How Do I Buy Golf Clubs for Women? Do I Need to Have My Own Golf Clubs to Play Golf?